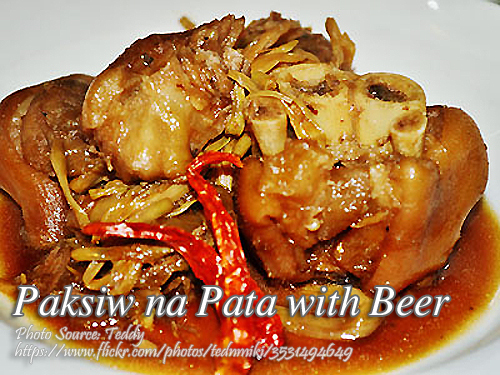 Paksiw na pata with beer is almost the same as the well known paksiw na pata which is pork legs stewed in vinegar, soy sauce, sugar and spices. The only difference is the addition of beer to give a more flavorful taste. Beer can enhance the flavor of many dishes like the pork barbecue marinade. It can also lessen the strong odor of the pork meat. Buying the pork legs is sometimes tricky because some vendors sell pork which have a very strong smell. And I think the pork leg comes from the old male or stud pig which has a stronger odor. I learned also that when buying pork knuckles or pork legs, choose the front legs because the hind legs have stronger odor. To see the complete recipe and list of ingredients, continue reading. Brown sugar to taste, about 4 Tbsp. Wash and clean chopped pata pieces and place in deep saucepan. Add beer and enough water to cover and cook until tender. Add the rest of the ingredients except bananas and continue cooking. Add bananas and simmer for 5 minutes more. Makes six servings.